World War II came to a close in Europe on May 8, 1945. In the months and years that followed, European nations struggled to repair their cities, feed their citizens and find a sense of normalcy. In November 1945, months before the war ended, twenty-two American aid agencies came together to establish the Cooperative for American Remittances to Europe (CARE). The organization collected $10 donations from Americans to send packages to Europeans hit by the war. The first packages were sent to England and France. The U.S. government did not allow CARE boxes to be sent to Western Germany until February 1946. The first CARE packages contained surplus Army rations that were meant to supply thousands of American soldiers had the war continued. Some of the items included tinned meat, cheese, canned fruit and vegetables, sugar, coffee, and tea. Later boxes included clothing, shoes, school supplies and other needed items. The last CARE packages were sent in 1955. However, CARE lived on as an organization, later renamed to “Cooperative for Assistance and Relief Everywhere,” and supported Germans during the Berlin Airlift and other international humanitarian crises. Linden, Eugene. The Alms Race: The Impact of American Voluntary Aid Abroad. New York: Random House, 1976. Ruz, Camilla. "The man who kept a quilt for 70 years. "BBC News Magazine, October 17, 2015. Schaum, Marlis. 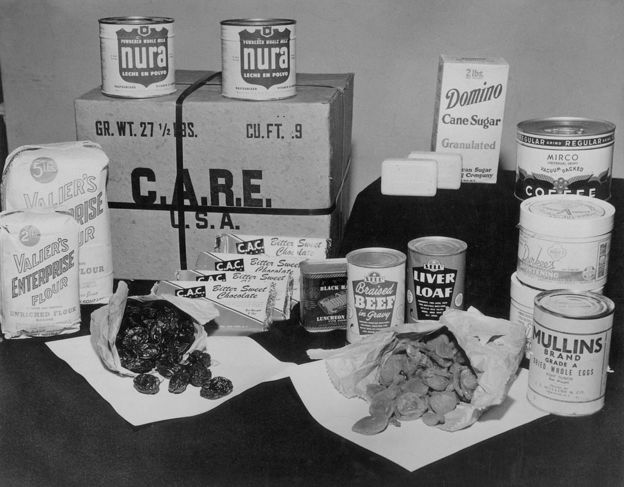 "CARE Packages prevented starvation in post-war Germany. "Deutsche Welle.